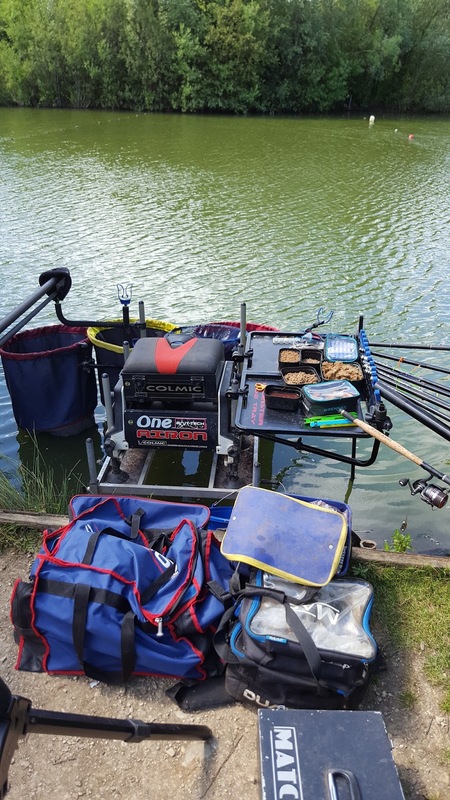 Liam Dennick Fishing : Sunday 17th July. Mick Telling memorial match today at wick water. With it being really warm it was always going to be hard. This was the first time I'd ever seen this place and I must admit, it's a lovely looking lake! Getting to my peg. Peg 15. It was really shallow close in so I decided to use a platform. 1 - my nets are in deeper water. 2- I get further out passed the trees as this peg has trees surrounding it. 3- I'm another metre out from the anglers next to me. Meaning when I fish long I'm automatically fishing longer than them! I fished a positive match. I started off really slow. Didn't have a sign for an hour then lost one on the Waggler so as it fishing hard I decided to stay on it. I lost 3. 1 broke me and 2 just pulled out. Came nowhere with that but still had a few bites. I felt I didn't really do my homework and maybe should of tried a bomb over the top of this as a few fish were caught on this but this should lead me in good stead for the next time I return back. We managed to raise £340 for Cancer Research so that was brilliant. So well done to Chris Telling and everyone who came along. And Well done to the 6 qualifiers. Good luck in the final!